Global Angels was the nominated charity for this years Cannes Young Lions Film Competition. The competitors, who had already made it through tough competitions for their spot in this esteemed competition, had 48 hours to put together a 60 second advert for Global Angels ‘Step Up’ campaign. Molly Bedingfield, Global Angels’ founder, kicked off the competition by giving the Young Lions a brief on our Step Up campaign. The identity of the charity has been kept under wraps since early this year, to ensure the teams had no advantages or time to familiarize themselves with our style and branding. All 38 teams of 2 were given a Nokia N8 to film on and were allowed to use images from the Getty image library along with some basic images provided by Global Angels. The limited material meant teams had to employ their creativity and make use of their surroundings to come up with something original that would fit the brief. The winners were revealed on Saturday June 25th. Gold went to Omar Sotomayor and Gaston Soto from Lapiz USA. Silver went to David Everson and Tamar Retter of M-NET, South Africa, and Bronze went to Ben Clare and Alex Romans of Johannes Leonardo NY, USA. The winners received free entry and accommodation to next years festival, along with all the prestige and amazing opportunities that come with winning such a renowned competition. Check them out with the photos below. Aside from the winners, we had some other favourites and were amazed at how all the Young Lions were so creative with the little materials they had. We’ll be posting out some of the other videos we loved over the next couple of weeks so keep your eyes peeled: they’re great! 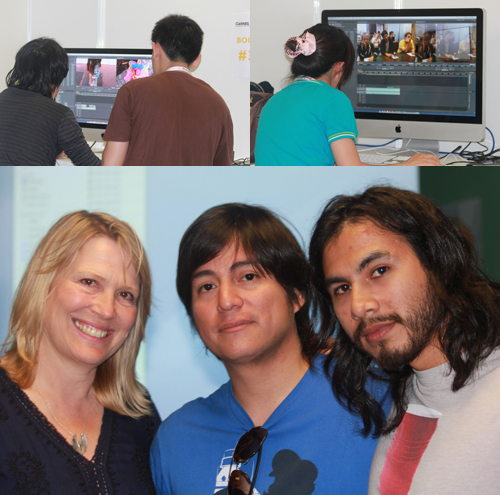 Photos (from top): Competitors hard at work & Molly with the USA Winners Omar Sotomayor and Gaston Soto. Well done!